(W) Gene Luen Yang & Various (A/CA) Gurihiru. Written and drawn by the team behind the best-selling The Promise and The Search, Gene Luen Yang and Gurihiru (in collaboration with Airbender and Korra creators Michael Dante DiMartino and Bryan Konietzko), this is the ultimate continuation of Avatar and the perfect companion to Legend of Korra! o A low-cost entry into the New York Times best-selling series! 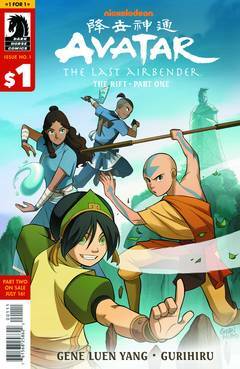 o Look for Avatar: The Last Airbender-The Rift Part 2 .